College students really are getting younger. 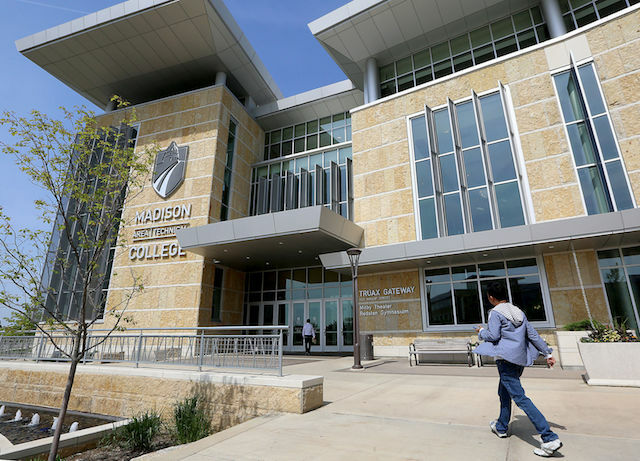 This year, 26 students from East High School and La Follette High School spend their days taking classes at Madison Area Technical College’s Truax Campus. They are the first cohort of MMSD’s Early STEM Academy Program. By the time they graduate high school in May of 2020, they will have not only earned their high school diploma, they will also have earned an Associate’s Degree in a Science, Technology, Engineering or Mathematics (STEM) field. Across America, the STEM field suffers from a lack of diversity. Very few female students, students of color or low-income students express interest in a STEM field by the time they reach high school. This gap has garnered a great deal of attention from current STEM professionals and from education institutions, including MMSD. Many worry that the lack of diversity reduces innovation in STEM fields. From the beginning, MMSD Superintendent Jennifer Cheatham and MATC’s President Jack Daniels conceptualized the program to align with the inclusion and diversity efforts of both institutions according to Mirus. “We started to dig into this across the nation and looked into early college programs. We saw that in STEM students of color and females are underrepresented,” Cindy Green, Executive Director of MMSD’s Secondary Programs and Pathways, said. Students graduating from MMSD high schools fit the national trend; college bound female students, students of color and low income students are unlikely to enroll in a STEM program. In an attempt to reverse this tend, MMSD is intentionally guiding students who are not typically represented into STEM classrooms. MMSD’s commitment to equity underpins the decision to consider students who are atypical of STEM programs. “Based on our focus as a district and our focus on Black excellence, we wanted to privilege our students of color. So we targeted students of color, females and families of low socioeconomic status, and first generation students. They were our main target groups,” Green said. Because of their diversity, the current students who are enrolled in the academy fit an unusual demographic makeup for a STEM program. “The pilot program has twenty six students; fourteen are females. We have sixty percent underrepresented minority students, about half of the students are low income and a quarter are first generation college students,” Mirus said. The students were not hard to find and recruit. When counselors began recruiting and recommending students to apply for the STEM Academy in the fall of 2017, they saw a great deal of interest from parents and students. ”Our original concern was, will we have enough kids apply? And then we had 66 kids apply and then we could accept 26. We had more interest than we could accept seats for,” Green said. In order to apply to the STEM Academy , student had to have a 2.5 GPA, 90% attendance and successful completion of all 9th and 10th grade course plus teacher recommendations. The twenty six students who were accepted now spend their days working through a curriculum specifically designed for high school students by Mirus and his colleague, Juanita Comeau, Director of College and Career Transitions at MATC. The schedule is designed so students can return to their high schools in order to participate in after school programs such as football, or theater. “We encourage them to stay connected and not detach from their home school, so they can be a good role model” Mirus said. The academy has to to meet Department of Public Instruction, MMSD and MATC curricular standards, and set students on a path toward a career in STEM. “There is a huge orchestra playing this song,” said Mirus about the effort to create the academy. To ensure that students could earn their high school diplomas as well as a college degree in a STEM field, “[MMSD and MATC] looked at what would be expected of a tenth graders, and then matched that up to courses we offered, so courses taken here, go back to their high school transcript,” Mirus said. All of the students have the same advisor who gets to know each student individually in order to help them choose STEM courses in their senior year and to support them as they transition to a college environment. “We knew a lot of student don’t know how to do college. They are 15 years old, so they need lots of support wrapped around them. We arrange special advising and registration session just for them,“ Mirus said. This kind of support is necessary for the students to succeed. “The holistic support is really critical. What a college student coming in needs from student developmentally is very different than what a high school student needs,” Comeau said. As another way to support students, MMSD recruited teachers from the student’s high schools to teach courses at MATC. “We want to make sure our staff saw equal investment [in the academy] and we were not losing them. And, two, [the students] are still young people and we want to make sure there are some high schools staff available who understand their social and emotional learning needs,” Green said. One of those teachers is Reichling, who teaches one section of college algebra to ten of the STEM Academy students, along with fourteen other college students not enrolled in the academy. After he finishes teaching that course, he heads back to his job at La Follette teaching physics. The program is getting ready to expand to one hundred students next school year, and will accept applications from all four comprehensive high schools, as well as from the district’s two alternative high schools. Green said this is the right direction for the STEM Academy because of its popularity with parents and students. “We are more concerned we will have way too many kids. We are opening to all six (high schools). We think there will be have to be difficult decisions,” Green said. Next year, students will attend classes at a new campus, MATC’s south campus, which will have even more expansive laboratories and equipment than the Truax campus. Green presented findings from a qualitative survey from the students to the MMSD school board on November 5th and heralded questions from them about the feasibility of the program continuing. While the program will costs MMSD over half a million dollars a year, Green said the program is worth the investment. “We think it is exciting for kids to have choice and for kids to be able to choose something in their area of interest, “ Green said. Once the School Board approves funding for next year’s STEM Academy, recruiting for next year can begin. “Kids have been so excited about it. We had a meeting about MATC during lunch time and they are so happy and every student I’ve talked to has said it is going well. I’m really energized by that,” Judy Christenson, school counselor at La Follette High Schools, said.